Creators are paid 30 days after project approval (net 30). Keeping your payment details accurate is crucial to receive payments on time. Our weekly payment cycle falls on Thursdays. If your work contract is completed after that time, it will be processed the following week. Thus, payment will be disbursed between 28 and 36 days from the date your project approves. Domestic payments are disbursed through bank transfer whenever possible. All international payments are disbursed via PayPal. How you will be paid depends on where you are located and the location of the 90 Seconds organization that you are providing services to. For this reason, you must provide both bank details and PayPal account information. For local payments made via Bank Transfer, allow 1-2 working days for the amount to be reflected in your bank account. For international payments made via Bank Transfer, do allow 3-5 working days for the amount to be reflected in your bank account. For payments made via PayPal, it will take 2-3 working days for the payment to be processed. Hit the accept button for the amount to be accepted in your Paypal account. Confirm that your payments are Claimed into your PayPal account, otherwise PayPal will return the funds after 30 days. 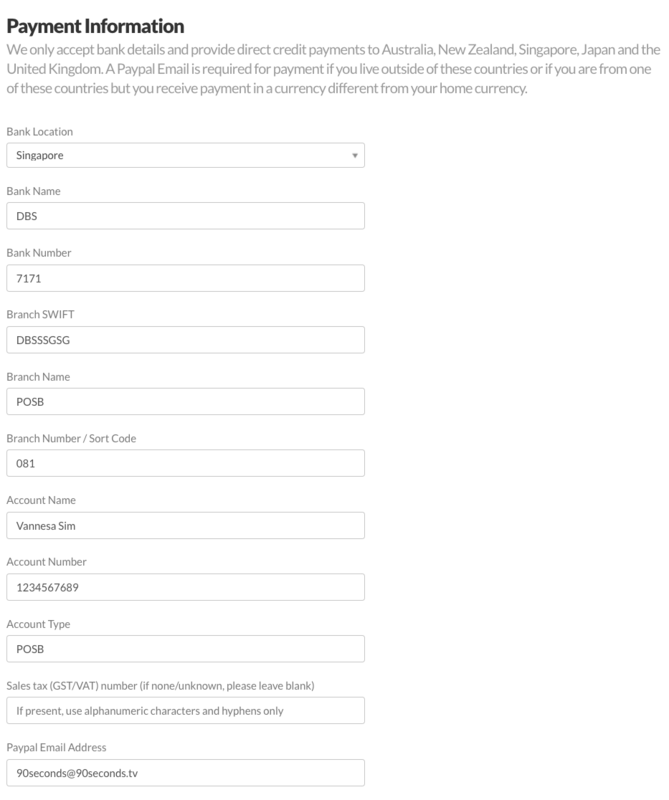 If there are PayPal fees incurred after receiving payment, take a screenshot of the transaction(s). Email them to our Finance team, accounts@90seconds.tv to receive your reimbursement. Reimbursements can take up to 2 weeks to be processed. Any fees associated with transferring PayPal funds to your bank account are the responsibility of the creator.